One thing you’re sure to discover while you’re in the area is that there are plenty of Windsor restaurants to choose from. If you’re struggling to decide what you fancy eating, let us give you a helping hand by pointing you in the direction of our established independent restaurant, in the heart of the town. We know that there are some fantastic chain restaurants in Windsor but we feel that you will always get something special when choosing an independent restaurant. Chain restaurants have to provide their customers with the same experience regardless of which branch they’re visiting. This means that they have to adhere to strict specifications for everything from the food they serve to the music they play. In order to maintain the same standards across the country, it’s a bit ‘samey’. In our independent Windsor restaurant, you get a unique experience you won’t find anywhere else. Independent restaurants are usually family-run or are operated by a close-knit team. Their survival depends on providing excellent customer service so you can guarantee that the service is going to be incredibly attentive. Because independent restaurants also tend to be smaller, it means that the staff have more time to focus on you and your needs. As we mentioned above, chain restaurants have strict standards they need to meet in order to ensure continuity across their branches. While they may be able to remove an ingredient from the dish you’ve selected, they’re fairly limited when it comes to allowing guests to make menu alterations. Here at Windsor Grill, we let the ingredients do the talking and will have all sorts of different specials based on the best produce we’ve been able to procure that day or week. If you make a suggestion to a chain restaurant, it will probably take months to reach the person in charge and if changes are discussed, it could take a very long time to implement them. With an independent restaurant, changes can be made almost immediately. Say for example there’s a cocktail you’d like to see on the menu, or that some flowers might brighten the place up a bit, an independent restaurant is far more likely to take your suggestions seriously and they can act on them almost immediately. We offer a great sense of community, ensure that chain restaurants keep their prices competitive, provide variety and you’ll always know that David, our chef patron, wont be far away, either in the kitchen or front-of-house. Whether you’re looking for Windsor restaurants to go for a birthday meal, a romantic night out, dinner with friends or colleagues or you need somewhere to eat in between sight-seeing, our team would love to see you. 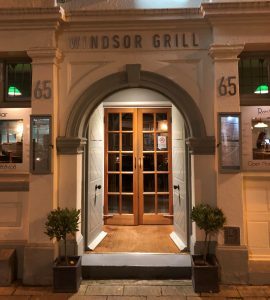 To book a table at Windsor Grill contact us on 01753 859 658 today.